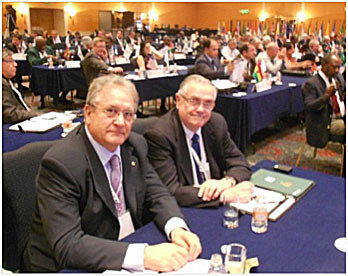 IBAF President Riccardo Fraccari attended the 50th General Assembly of the Pan American Sports Organization (PASO) in Mexico City. The Assembly confirmed in his chair long time President Mario Vazquez Rana (Mexico). The greatest asset of PASO is the Pan Am Games and baseball is a part of it since the opening edition (Buenos Aires 1951). During the Assembly the PASO Medical Commission reported that the baseball tournament of the 2011 edition in Guadalajara (Mexico) was played clean and in compliance with the anti doping Code. The PASO Assembly was also a chance for the IBAF and the International Softball Federation (ISF) to hold private meetings on the matter of Olympic reinstatement. President Fraccari met with ISF President Don Porter to analyze various points of the Memorandum of Understanding (MOU) for a joint bid for the 2020 Games. Both Presidents acknowledged the potential once the MOU is signed. Now they will consult their respective Olympic Reinstatement Committees to ensure that the wording on the agreement meets the approval of both parties. Fraccari and Porter will meet again on March 17 at the Dutch Federation 100th anniversary Gala in Rotterdam. The Gala will be another occasion to finalize an agreement and officially move forward together. After an agreement is sealed, the MOU will be presented to the International Olympic Commitee (IOC) for approval. This could eventually reduce the total number of sports on the shortlist for reinstatement to 7. During the General Assembly (coinciding with the 100th anniversary of the Japanese Olympic Committee) of the Olympic Council of Asia (OCA), an agreement between the 2 International Federations led to the inclusion of softball in the program of the 2014 Asian Games as a discipline of baseball. IBAF and ISF will have a shared stand at the upcoming Sportaccord Convention in Quebec City (Canada).